A distinctive light cup that has hints of orchid-like flavor. Excellent for quiet moments. Manufacture Type(s): Semi fermented, Traditional process, Small batch crafted and formed. 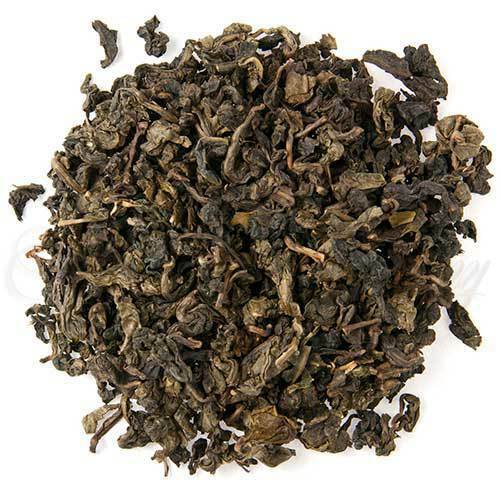 Oolong tea is semi fermented which is one of the reasons it has such a unique character. The semi fermentation gives the tea a little bit more body than a green tea but less body than a black tea … and interestingly it gives the flavor a very unique twist. You will see (particularly in the infused leaf) that the edges of the leaves are slightly bruised (brownish). The reason for this is that the leaves are lightly bruised to start the oxidation process. Because they are more full bodied than green teas, oolong teas must not be picked too early or at too tender a stage. They must be produced immediately. Unlike leaves for green tea, those destined to be oolong are wilted in the direct sun and then shaken in tubular bamboo baskets to bruise the leaf edges. The bruising is what makes the edges oxidize faster than the center. After 15-25 minutes (depending upon ambient temperature and humidity levels) the tea is fired, locking in the special flavor profile. There are several grades of Ti Kuan Yin (a.k.a Iron Goddess of Mercy). This particular type is the premium grade – below the superior grade but has many of the characteristics of top Ti Kuan Yin Oolongs. It has been written that Ti Kuan Yin is at first bitter, then sweet and finishes with a fragrance, which lingers on your palate. We find this particular grade is sweet with a fragrant finish and has no bitter notes. Hot tea brewing method: Traditional method (see note below): When preparing by the cup, this tea can be used repeatedly – about 3 times. The secret is to use water that is about 180°F/82°C**. Place 1 slightly heaping teaspoon in your cup, briefly infuse with freshly boiled water and then pour off. Re-infuse the tea and pour after about 1 minute or longer to taste and then begin enjoying a cup of enchantment – do not remove the leaves from the cup. Adding milk and sugar is not recommended. Once the water level is low – add more water, and so on and so on – until the flavor of the tea is exhausted. Look at the pattern of the leaves in the brew, not only do they foretell your fortune but you can see the bud and shoots presenting themselves, looking like they are about to be plucked.